Freeport, Grand Bahama Island - Paradise Jewels has relocated from the International Bazaar to Retail street at the Grand Lucayan. This beautiful store offers an expanded range of fine jewelry at Duty Free prices. Diamonds, blue diamonds, brown diamonds, emeralds, sapphire, rubies, tanzanite and pearls make up part of this outstanding inventory. Semi precious stones, and a sterling silver collection by award winning designers add to the mix of gold and stainless steel. Competitive prices is a major part of the store policy. There is a jeweler (Ken Thompson) on site to take care of alterations or sizing to ensure your purchase is perfect before you leave. 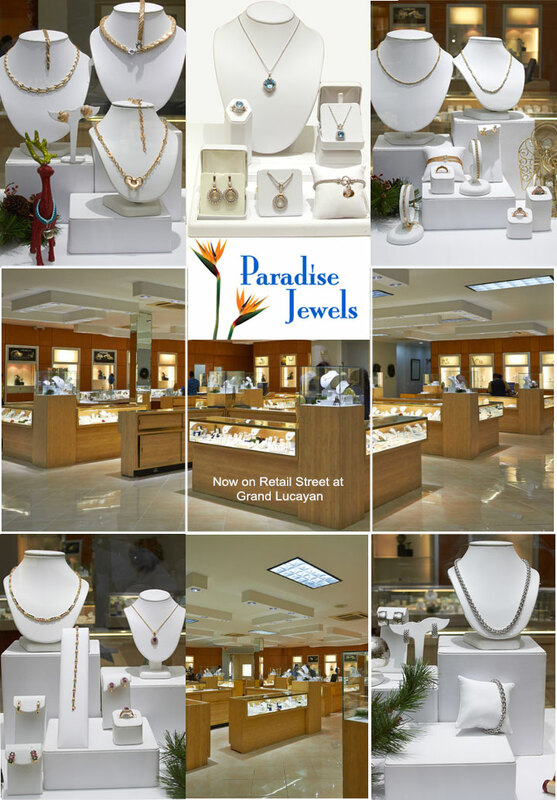 Paradise Jewels has Grand Bahama's largest selection of affordable jewelry. Telephone (242) 351-1392.